Temecula, CA :The 2019 NPSL league season started on a cold wet night at Chaparral High School home of Temecula Football Club who had to play with 10 men for 70 minutes to get all 3 points last night vs City of Angels FC. The Quails opened the scoring early when Joey Ciochetto stole the ball off a City of Angeles defender to slot home from 10 yards out. 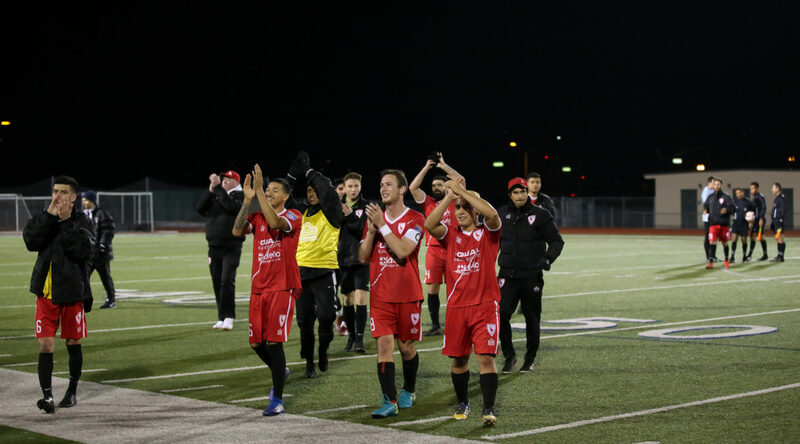 The celebrations did not last long from the Temecula FC supporters who braved the 47 degree weather which is cold for California as the goal was followed up shortly with a second yellow to Eddie Gurrea for embellishment. Former Temecula FC youth player Byron Rivera tapped in from close range after Joey Ciochetto’s defected shot for the second goal to give Temecula FC a two-goal lead, before City replied with a penalty kick to cut the lead in half to 2-1. Man of the Match winner Joey Ciochetto got his second goal on the night to end the first half 3-1 with the Quails in the lead. City of Angels came out strong in the second half and got their 2nd goal 10 minutes in and spark some life in the away team. City would continue to take advantage of the extra man but were unable to create much in terms of chances. On the other hand Temecula FC kept creating chances on the counter attack and came close a few times to extending their lead. Temecula FC’s Justin Picou just on as a sub had a volley that put fear in the City GK late on but the ball went just wide of the right post.